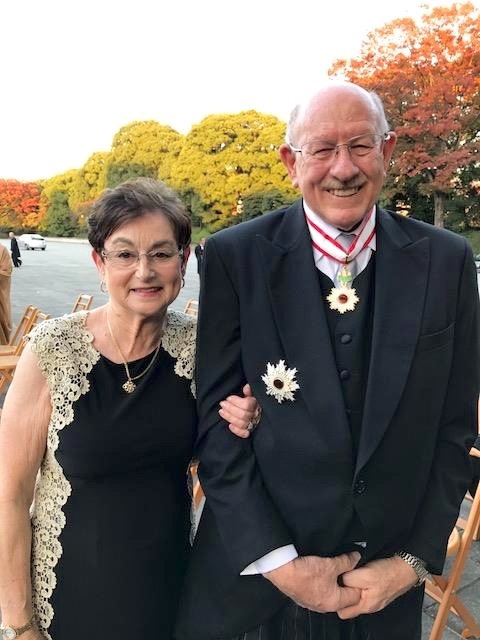 Dr. Jonathan Dorfan, President Emeritus of the Okinawa Institute of Science and Technology Graduate University (OIST), received the Order of the Rising Sun, Gold and Silver Star, one of Japan’s most distinguished national decorations. The OIST community sends its warmest congratulations to Dr. Dorfan. The official citation states that the decoration is in recognition of “contributions to the development of our nation’s research and education in science and technology”. The Conferment Ceremony took place in the Imperial Palace in Tokyo on November 7th. Dr. Jonathan Dorfan and Mrs. Renee Dorfan pose for a photo after the conferment at the Imperial Palace in Tokyo. Jonathan Dorfan joined OIST in August 2010, from Stanford University where he had been Director of the Stanford Linear Accelerator Center (SLAC) from 1999 to 2007. Dorfan was President-elect of OIST until the accreditation of the university was conferred and the University was established in November 2011, at which time he became President of OIST and CEO of the OIST School Corporation. During his mandate as President, Dr. Dorfan turned the conceptual aims of OIST into reality, establishing a cutting-edge environment for interdisciplinary research and education comprising world-competitive faculty and students, and state-of-the-art research infrastructure. Dr. Dorfan successfully built on the foundation laid in 2005-2011 by the OIST promotion cooperation to complete the first phase of the University campus, overseeing the addition of: two laboratory buildings; educational space and facilities; an auditorium with adjacent conferencing capabilities; an on-campus Village with apartments, free-standing houses and quality-of-life support functions; a Child Development Center building which currently provides 10 hours per day of care for 140 children from ages 2 months to 5 years; a Marine Science Station adjacent to the East China Sea and an Engineering Support building. With the planning of Laboratory 4 he also initianted the second phase of OIST’s growth, which will double the size of the University by 2023. From the outset and without compromise, Dr. Dorfan established all aspects of the university under the highest standards, compatible with those of the best worldwide research universities: in particular, the hiring and advancement of faculty and the admission of graduate students. Forty faculty and one-hundred-and-forty students were recruited to the University during Dr. Dorfan’s tenure. The University is highly international – the faculty and students come from 35 nations/regions on six continents. Dr. Dorfan retired from OIST in December 2016 and was succeeded by Dr. Peter Gruss, former President of the Max Planck Society. OIST President Emeritus Jonathan Dorfan will receive the Order of the Rising Sun, Gold and Silver Star from the Japanese government.